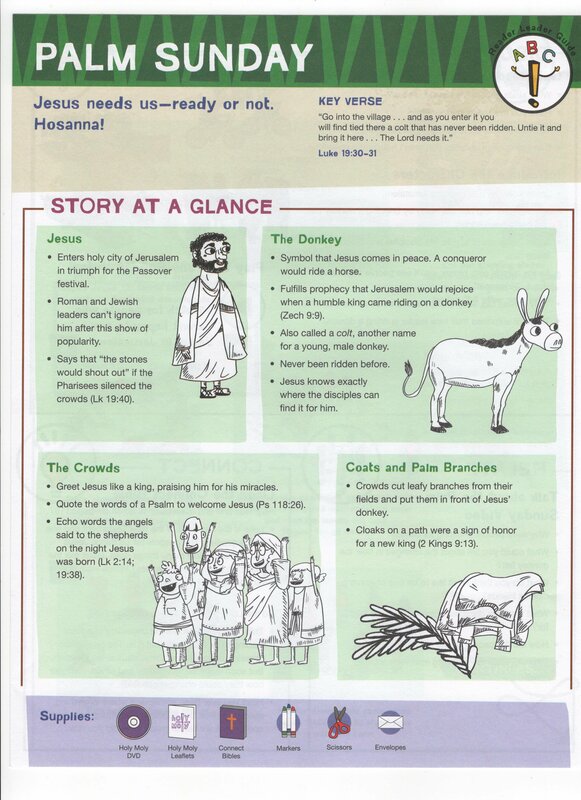 "Palm Sunday: Jesus' Triumphal Entry into Jerusalem"
In the accounts of the four canonical Gospels, Jesus' Triumphal Entry into Jerusalem takes place in the days before the Last Supper, marking the beginning of his Passion. Crowds gather around Jesus and believe in him in John 12:9-11 after he raised Lazarus from the dead, and the next day the multitudes that had gathered for the feast in Jerusalem welcome Jesus as he enters Jerusalem. In Matthew 21:1-11, Mark 11:1-11, John 12:12-19, and Luke 19:28-40 (which we will be discussing this Sunday), Jesus descends from the Mount of Olives towards Jerusalem, and the crowds lay their clothes on the ground to welcome him as he triumphantly enters Jerusalem. Traditionally, we celebrate Jesus' entry into Jerusalem as Palm Sunday, a week before Easter Sunday. During this week's lesson, we will read this passage and discuss the story. We will watch a short video, where we will watch for people who aren't happy to see Jesus in Jerusalem, and talk about the video through interactive, thoughtful questions, such as:Why were people cheering for Jesus? What do you think it felt like to be one of Jesus' closest friends? What were the disciples helping Jesus get ready for? And, How did the people on the road help him? Next, we will create a craft that will reflect on the meaning of this important day. GOOD FRIDAY CHILDREN'S SERVICE APRIL 14TH AT 10 AMRemember our Good Friday service for kids of all ages? 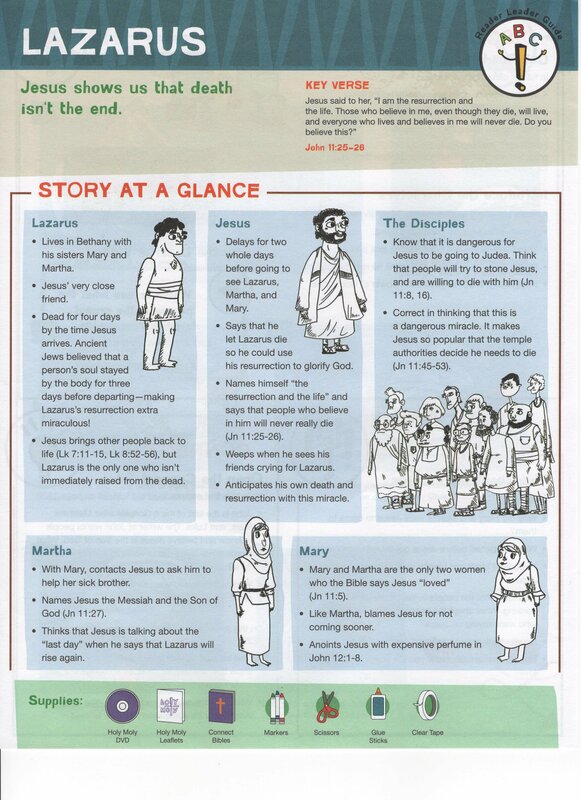 We will walk through the last week of Jesus' life in an interactive, kid-friendly way. This is a great chance for kids to learn the story in language that speaks to them and their world, and can be very meaningful and thought-provoking for them. Please join us! EASTER SUNDAY EGG HUNT Easter is coming soon - April 16th!We're looking for a few parents to help lend a helping hand with our popular Easter Sunday egg hunt. It is always a fun time! Please email Jennifer Klein at jklein71@optonline.net if you're able to help or want to learn more. Thank you! Sunday School is for kids ages 4-12 and takes place in the undercroft from 10-10:30. Teachers, the current teaching schedule can be foundhere. Please let me (Jennifer Klein) know if you need to make any changes. Thanks for all you do! In Sunday School this week, the children will be be making "resurrection gardens" (pictured below,) which should sprout just in time for Easter! For those who can't make it this Sunday, they'll have another chance to make theirs (or finish it) next Sunday, April 9th (which is Palm Sunday,) or at the Good Friday Children's Service on April 14th (at 10 am.) Please join us! SUNDAY SCHOOL LENTEN PROJECT Our Lenten offering is growing, thanks to your generosity. Let's keep it up! Please, send your child to Sunday School with a pocket full of loose change (or in the plastic Easter egg they picked up last week) and we'll put it in the offering plate to help us support the important work of Episcopal Relief and Development (ERD). Further information - and plastic eggs! - will be available in the pews throughout Lent. If you'd like to learn more about ERD, here's the website. GOOD FRIDAY CHILDREN'S SERVICE APRIL 14TH AT 10 AM Remember our Good Friday service for kids of all ages? 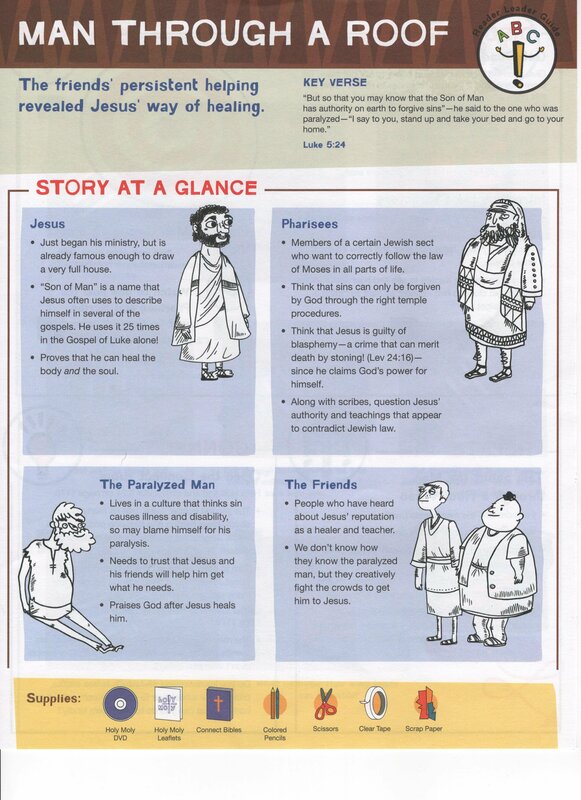 We will walk through the last week of Jesus' life in an interactive, kid-friendly way. This is a great chance for kids to learn the story in language that speaks to them and their world. Thank you to those who have signed on to help us lead this service! We can always use more voices and more help, both with the service itself and the craft, so if you're interested in learning more, please let Jennifer Klein at jklein71@optonline.net or Dana in the office, know. We hope to see you there! EASTER SUNDAY EGG HUNT Easter is coming soon - April 16th!We're looking for a few parents to help coordinate our popular Easter Sunday egg hunt. It is always a fun time for the kids! Please email Jennifer Klein if you're able to help in any way or want to learn more. Thank you! Sunday School is for kids ages 4-12 and takes place in the undercroft from 10-10:30. Teachers, the current teaching schedule can be foundhere. Thanks for all you do! The Parable of the Good Samaritan is a didactic story told by Jesus in Luke 10:25–37. It is about a traveler who is stripped of clothing, beaten, and left severely hurt alongside the road. First a priest and then a Levite comes by, but both avoid the man. Finally, a Samaritan happens upon the traveler. Samaritans and Jews generally despised each other, but the Samaritan helps the injured man. 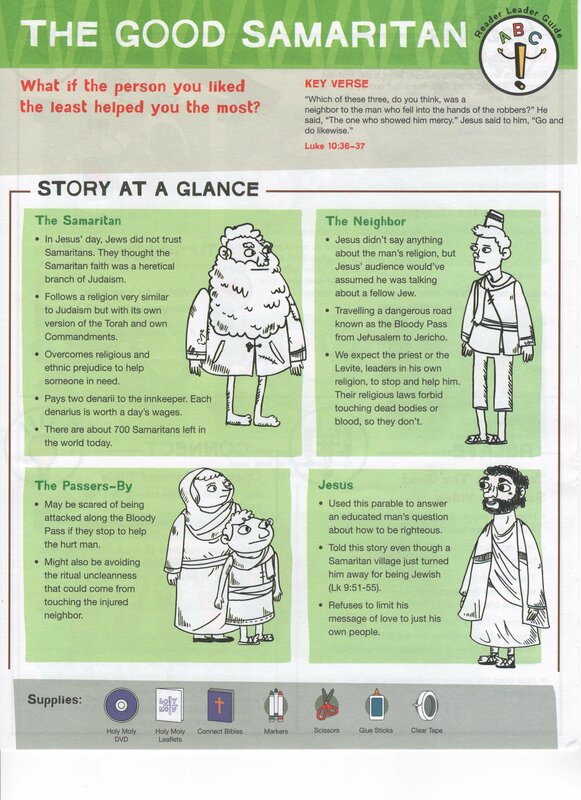 Jesus is described as telling the parable in response to the question from a lawyer, "And who is my neighbor ?" whom Leviticus 19:18 says should be loved. In response, Jesus tells the parable, the conclusion of which is that the neighbor figure in the parable is the man who shows mercy to the injured man-- that is, the Samaritan. He then tells the lawyer to "go and do likewise." His answer corresponds to his words in the Gospel of Matthew 5:43-48, to love one's enemy. The parable has inspired painting, sculpture, satire, poetry, and film. The colloquial phrase "Good Samaritan," meaning someone who helps a stranger, derives from this parable, and many hospitals and charitable organizations are named after the Good Samaritan. During this week's lesson, we will read this passage and discuss the story. We will watch a short video, and talk about the video through interactive, thoughtful questions. We will create a fun craft where the children will make a chain of hearts and hands showing people and ways they can help. We will ponder the question: What if the person you liked the least helped you the most? SUNDAY SCHOOL LENTEN PROJECT Our Lenten offering is growing, thanks to your generosity. Let's keep it up! Send your child to Sunday School with a pocket full of loose change (or in the plastic Easter egg they picked up last week) and we'll put it in the offering plate to help us support the important work of Episcopal Relief and Development (ERD). Further information - and plastic eggs! - will be available in the pews throughout Lent. If you'd like to learn more about ERD, here's the website. LOOKING AHEAD: GOOD FRIDAY CHILDREN'S SERVICE APRIL 14TH AT 10 AM Remember our Good Friday service for kids of all ages? We will walk through the last week of Jesus' life in an interactive, kid-friendly way. This is a great chance for kids to learn the story in language that speaks to them and their world. Please join us! EASTER SUNDAY EGG HUNT Easter is coming soon - April 16th! We're looking for a few parents to help coordinate our popular Easter Sunday egg hunt. It is always a fun time! Please email Jennifer Klein if you're able to help or want to learn more. Thank you! This Sunday is the SECOND SUNDAY IN LENT, and the Sunday School children have started their annual Lenten fundraising project to buy a sheep, goat, pig or flock of chickens for a family in a developing country through Episcopal Relief and Development... and you can help them by bringing spare change from home to church on Sunday! Further instructions will be available in the pews throughout Lent. If you'd like to learn more about their project and Episcopal Relief and Development, here's the website. 17 On his arrival, Jesus found that Lazarus had already been in the tomb for four days. 18 Now Bethany was less than two miles from Jerusalem,19 and many Jews had come to Martha and Mary to comfort them in the loss of their brother. 20 When Martha heard that Jesus was coming, she went out to meet him, but Mary stayed at home. In Sunday School this week, the children will learn that Jesus shows us that death isn't the end. During this week's lesson, we will read this passage and discuss the story. We will watch a short video, and talk about the video through interactive, thoughtful questions. We will construct a craft where the children will create a "Come out, Lazarus!" diorama. We will learn how God's love can bring light into any dark situation in our lives. In other news:PERSONAL CARE PANTRY needs help stocking their shelves for families in need. The items currently most needed are: Paper towels, toilet paper, tissues, laundry detergent, hair conditioner and dish washing liquid. Linens Ministry could use gently used blankets and new pillows. Furniture Ministry needs able bodied volunteers to help with pick-up and delivery. Please see Liz P. or Eileen D. for more info. Thanks! LOOKING AHEAD: GOOD FRIDAY CHILDREN'S SERVICE APRIL 14TH AT 10 AM Remember our Good Friday service for kids of all ages? 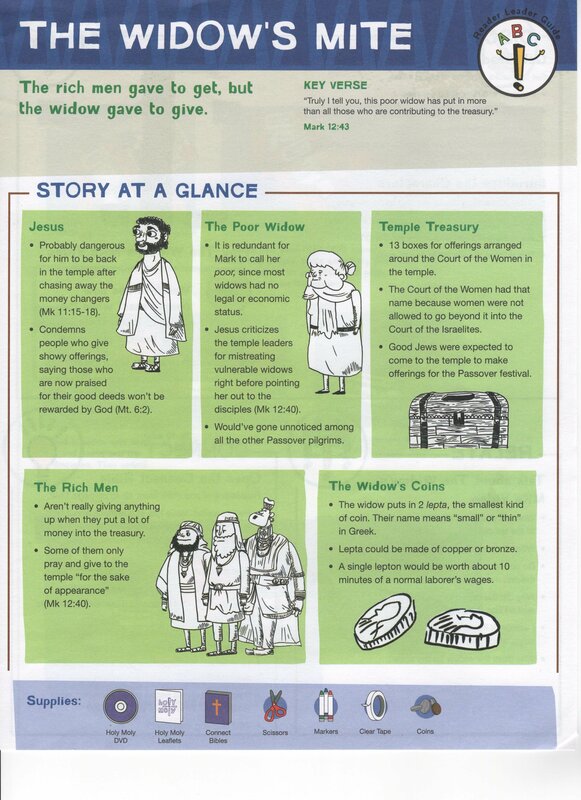 We will walk through the last week of Jesus' life in an interactive, kid-friendly way. This is a great chance for kids to learn the story in language that speaks to them and their world. EASTER SUNDAY EGG HUNT: LOOKING FOR HELP Easter is coming soon - April 16th! We're looking for a few parents to help coordinate our popular Easter Sunday egg hunt. Please email Jennifer if you're able to help or want to learn more. Thank you! ​Sunday School is for kids ages 4-12 and takes place in the undercroft from 10-10:30. Teachers, the current teaching schedule can be found here. Please let me (Jennifer Klein) know if you need to make any changes. Thanks for all you do! This Sunday is already the last Sunday before Lent, and the kids, as in years past, will be participating in a program to raise money to buy a sheep, or goat, pig, or flock of chickens for a family in a developing country through Episcopal Relief and Development. This Sunday, Liz Pavelka and Debbie Evans (from our very own Outreach Committee) will be re-introducing the children to this, and they will be learning all about why these gifts help families, and what the needs are in many parts of the world that have far less than we do. A good way to start off Lent, in other words! What is Episcopal Relief and Development? Episcopal Relief & Development works with Church partners and other local organizations to save lives and transform communities worldwide. They rebuild after disasters andempower people to create lasting solutions that fight poverty, hunger and disease. Working in close to 40 countries, their programs impact the lives of approximately 3 million people around the world. Their mandate is taken from Jesus’ words found in Matthew 25. All of Episcopal Relief & Development’s international development programs seek to mobilize local resources and expertise toward sustainable, community-led programs that address poverty, hunger and disease. In their disaster response and recovery work, they seek to build resilience and reduce risk at every stage. For more information, please see www.episcopalrelief.org . Our annual Shrove Tuesday Pancake Supper is coming up this Tuesday, FEBRUARY 28! Don't miss your one chance a year to eat pancakes for supper - because the Church tells you to! Shrove (or "Fat") Tuesday is the name we give the day before Ash Wednesday, which marks the beginning of Lent. Please join us for an evening of Pancakes, Sausage and Jambalaya! Tickets are $8 per adult and $5 per child. There are sign-up sheets at church for people who would like to volunteer to help out as well as a sign-up for kids to volunteer to be a server. The kids LOVE doing this, and it's a huge help. But above all, please plan to come out and eat pancakes! PERSONAL CARE PANTRY needs help stocking their shelves for families in need. The items needed for February are: Paper towels, toilet paper, tissues, laundry detergent and dish washing liquid. Linens Ministry could use gently used blankets and new pillows. Furniture Ministry needs able bodied volunteers to help with pick-up and delivery. Please see Liz P. or Eileen D. for more info. Thank you! In the story, a widow donates two small coins, while wealthy people donate much more. Jesus explains to his disciples that the small sacrifices of the poor mean more to God than the extravagant, but proportionately lesser, donations of the rich.During this week's lesson, we will read this passage and discuss the story. We will watch a short video, and talk about the video through interactive, thoughtful questions. We will create a fun craft where the children will make 2 coin boxes to save money to use for God and for themselves. We will learn how the rich men gave to get, but the widow gave to give. If your child (or children) are in fourth grade or higher, whether you have served previously as an acolyte or not, we invite you to take part in an acolyte training meeting. For one-half hour following the 10:00 AM service on Sunday, Feb. 19, meet in the church with Mrs. Liz Pavelka and Fr. Peter to learn (more) about serving as an acolyte at St. Nick’s. If you’ve not served in the past, please join us. If you have served, come and refresh your knowledge and skills. We need you all! needs help stocking their shelves for families in need. The items needed for February are: Paper towels, toilet paper, tissues, laundry detergent and dish washing liquid. Linens Ministry could use gently used blankets and new pillows. Furniture Ministry needs able bodied volunteers to help with pick-up and delivery. Please see Liz P. or Eileen D. for more info. ​During this week's lesson, we will read this passage and discuss the story. We will watch a short video, and talk about the video through interactive, thoughtful questions. We will create a fun craft where the children will make a chain of hearts and hands showing people and ways they can help. We will ponder the question: What if the person you liked the least helped you the most? Please note that until further notice, there will no longer be nursery care available during the 10am service. "Man Through a Roof," also known as, "Jesus Forgives and Heals a Paralyzed Man," (among other titles) is a New Testament story told in Luke 5:17-26. It says,17 One day Jesus was teaching, and Pharisees and teachers of the law were sitting there. They had come from every village of Galilee and from Judea and Jerusalem. And the power of the Lord was with Jesus to heal the sick. 18 Some men came carrying a paralyzed man on a mat and tried to take him into the house to lay him before Jesus. 19 When they could not find a way to do this because of the crowd, they went up on the roof and lowered him on his mat through the tiles into the middle of the crowd, right in front of Jesus. ​During this week's lesson, we will read this passage and discuss the story. We will watch a short video, and talk about the video through interactive, thoughtful questions. We will create a fun craft where the children will each cut a leaflet to show how Jesus' love and forgiveness are big enough to include everyone. We will learn about how the friends' persistent helping revealed Jesus' way of healing. needs help stocking their shelves for families in need. The items needed for January and February are: Paper towels, toilet paper, tissues, laundry detergent and dish washing liquid. Linens Ministry could use gently used blankets and new pillows. Furniture Ministry needs able bodied volunteers to help with pick-up and delivery. Please see Liz P. or Eileen D. for more info. Thank you to ALL who attended (and brought all that delicious food!) to this year's Annual Meeting and Parish Potluck last Sunday, January 29 at the New Hamburg Yacht Club. It was great to enjoy each other's company as we reviewed 2016 at St. Nick's, had important discussions of parish business, learned about our 2017 budget, Capital Campaign updates, Outreach goals and other important matters relative to parish life. We are looking forward to 2017 with you all, our wonderful parish! During this week's lesson, we will read this passage and discuss the story. We will watch a short video, and talk about the video through interactive, thoughtful questions. We will create a fun craft where the children will make a balance scale to reflect and think about activities in their lives. 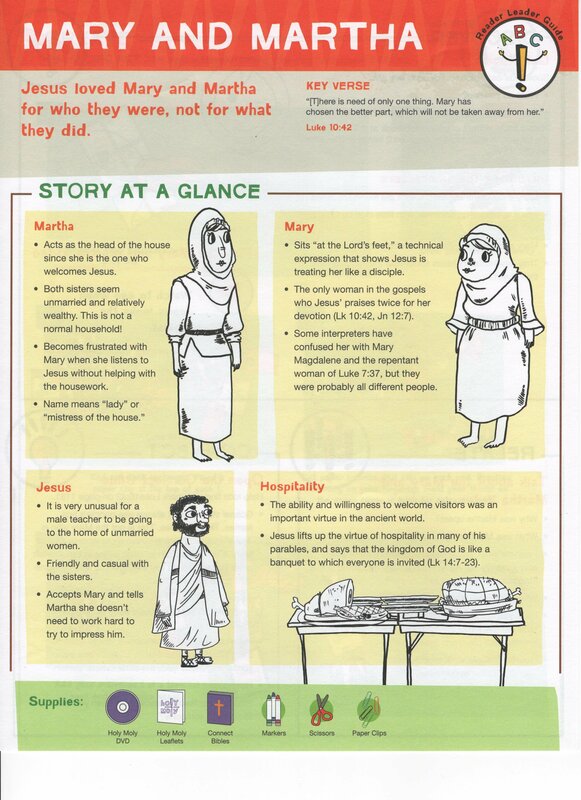 We will learn about how Jesus loved Mary and Martha for who they were, not for what they did. This years Annual Meeting and Parish Potluck will be this Sunday, January 29 at the New Hamburg Yacht Club following the 10am service. There will be important discussions of parish business, 2017 budget, Capital Campaign updates, Outreach goals and other important matters relative to parish life. We hope to see you there! Sunday School is for kids ages 4-12 and takes place in th undercroft from 10-10:30. Teachers, the current teaching schedule can be found here. Please let Jennifer Klein know if you need to make any changes. Thanks for all you do! 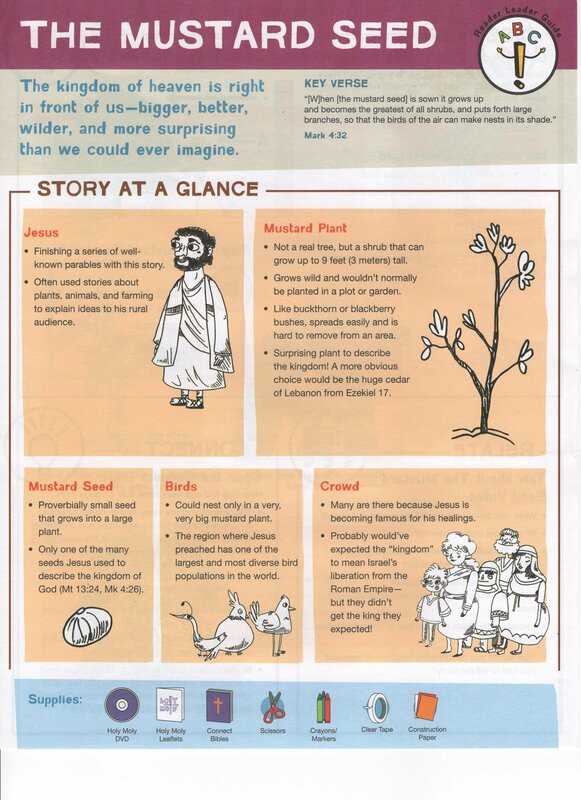 We will discuss with the children how in The Parable of the Mustard Seed, the Kingdom of God is compared to the growth of a plant. The seed of love is sown in people's hearts. It grows slowly and silently deep within each person. Every time someone does something good, no matter how small, it is a sign that God's love is in their heart. Jesus promised that from something small, slowly over time, amazing things will grow. The children will be participating in creating a craft together based on this meaningful lesson that we will be displaying for you all during coffee hour on Sunday. We hope to see you all! Teachers, you can find the current teacher schedule HERE. Sunday School is for kids ages 4-12 and takes place in the undercroft from 10-10:30.